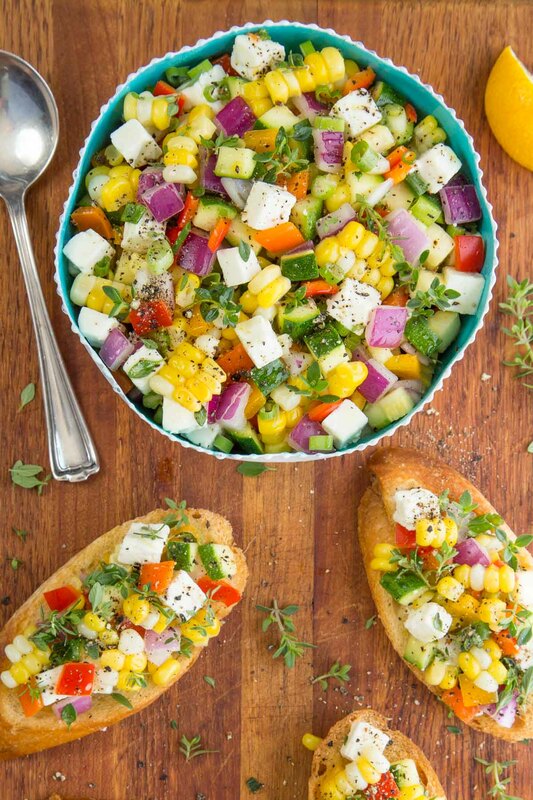 This fresh, delicious Farmer’s Market Feta Bruschetta is always a hit and easy to put together. It’s also super adaptable! Who can resist a delicious appetizer? 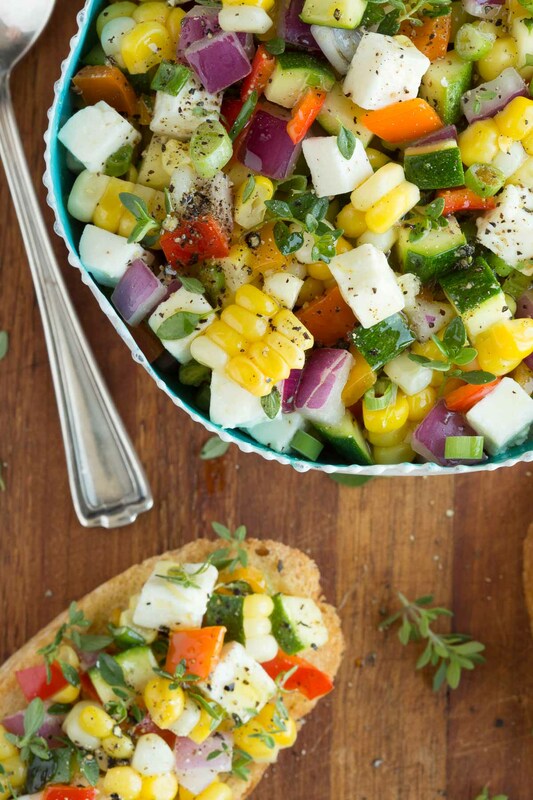 I especially love something light and fresh like this Farmer’s Market Feta Bruschetta. It doesn’t spoil anyone’s appetite for dinner ad it’s easy to put together. It’s also super adaptable to what’s in season! I decided to name this appetizer, Farmer’s Market Feta Bruschetta because the flavors and hues of the vibrant veggies seem to scream “summer”, that wonderful time of year when roadside stands and markets are brimming with delicious fresh produce. I used zucchini, bell peppers, red onions, scallions and lots of sweet summer corn. A splash of both lemon juice and olive oil along with chunks of salty Feta cheese and sprigs of fresh thyme finish it off. Simple ingredients, but when they all come together on a crisp crostini or a pita chip, it’s a fabulous taste sensation! A while back, we had some friends spend a weekend with us. I’d been busy preparing dinner and not long before they arrived, started thinking about an appetizer to serve. There was Pineapple Sriracha Jam and Balsamic Strawberry Black Pepper Jam in the freezer so knew I could add crackers and goat cheese for a delicious pre-dinner nibble. But something fresh and light sounded much better. This old standby came to mind so I checked the fridge and started pulling out some stash. Our guests loved this Farmer’s Market Feta Bruschetta and remarked as they were leaving, “we need the recipe for that appetizer you served on Friday night”. Up until now, I’ve just thrown everything together. I couldn’t really give any specific measurements. So I made it again and recorded amounts of all the ingredients. I’m happy to say, this Farmer’s Market Feta Bruschetta is now an official recipe! Keep this one on your emergency recipe stash. Add whatever veggies you have or like along with some diced (or crumbled) Feta. Serve it with crostini or pita chips. The bowl will come back clean no matter how high (or low) you fill it! Spoon it over arugula and top with leftover grilled chicken, steak or pork tenderloin. Use it as a topping for grilled burgers. Enjoy it as a fresh, healthy side for just about anything! 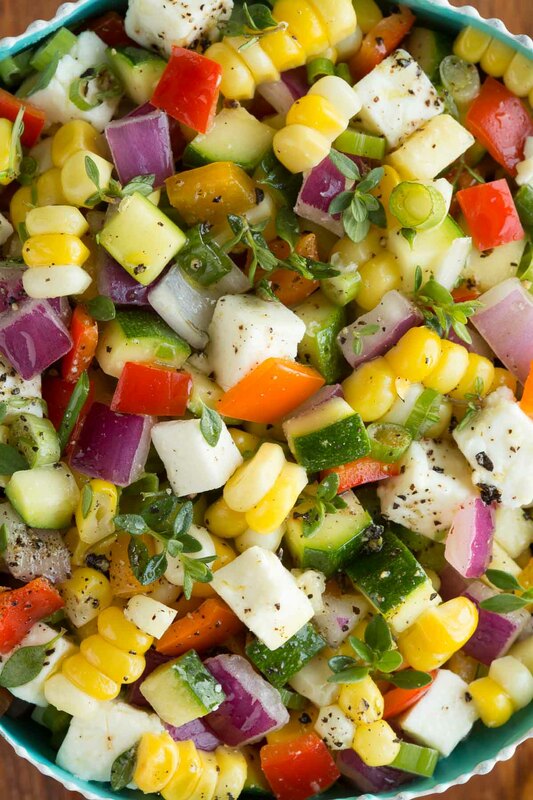 To make this Farmer’s Market Feta Bruschetta a breeze to put together, I use my Vidalia Chop Wizard to dice the zucchini, bell peppers and red onion. It takes minutes and makes a pretty presentation as all the veggies are uniform in size. Don’t overcook the corn. You want it just barely cooked with a nice crunch. I like to prepare my corn in the microwave. Simply place the corn right on the turntable, leaving the husk and silk intact. 2 ears of corn will take 3 minutes in my microwave. (Each microwave is a bit different so you will need to experiment a bit to determine exact time with yours.) After cooking, I allow the corn to sit until cool enough to handle, then cut the lower inch off of each ear. At this point, the husk and silk will be easy to pull off. This Farmer’s Market Feta Bruschetta is delicious with pita chips, tortilla chips or crostini (recipe below). 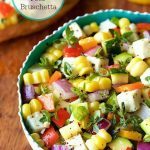 This Farmer’s Market Feta Bruschetta was originally shared back in July 2015. It’s way too delicious to be lost the Café archives of over a thousand recipes so we’ve tweaked the post, pictures, and recipes a bit and are sharing it again. Enjoy! A fresh, delicious appetizer that's always a hit and is super adaptable. 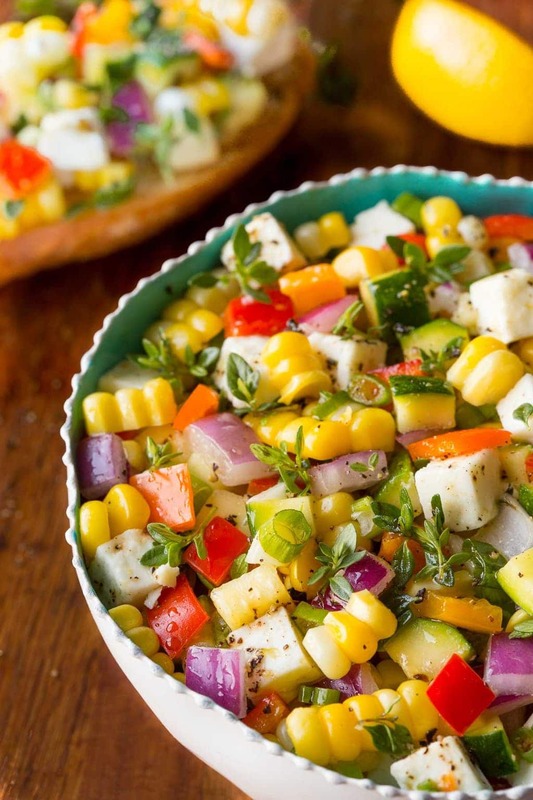 Use whatever veggies you've got in the fridge! Cut corn from husks. Transfer corn to a medium size bowl and discard husks. 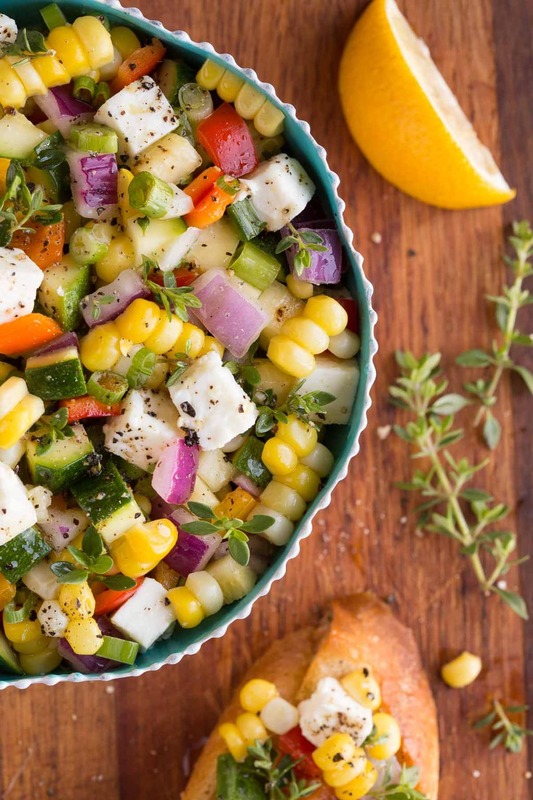 Combine zucchini, pepper, green onions and lemon zest in the bowl with the corn. Stir to combine. Drizzle with olive oil and stir well. Drizzle with lemon juice and sprinkle with sea salt. Stir again. Add Feta and thyme leaves, reserving 1 tablespoon of thyme for garnish. Stir gently. Transfer to a serving bowl and sprinkle with reserved thyme and freshly ground black pepper. Serve with crostini (see below) or pita chips. So simple but so tasty, these Crostini will make any simple party seem like a gourmet feast! Preheat oven to 350˚F. Line a large sheet pan with foil or parchment paper. Arrange baguette slices on prepared pan in a single layer. Mix together oil, butter and place in microwave for 1 minute or until butter is melted. Brush tops of each slice with olive oil mixture. Sprinkle lightly with kosher salt and fresh ground pepper. Bake for 10-15 minutes or until golden brown and crisp. Cool completely then store in an airtight container. See Café Tips above in post for further tips and instructions. It's fine to use olive oil only for these crostini instead of the butter/olive oil combination. Just made this in about 15 m inutes, added fresh from the garden tomatoes as well. Absolutely delicious! Thanks for letting us know Sharon, garden tomatoes make everything delicious! I actually could eat this for dinner and be very happy! So pretty and fresh and I do believe eating it would make me feel the same way! Thanks Chris.